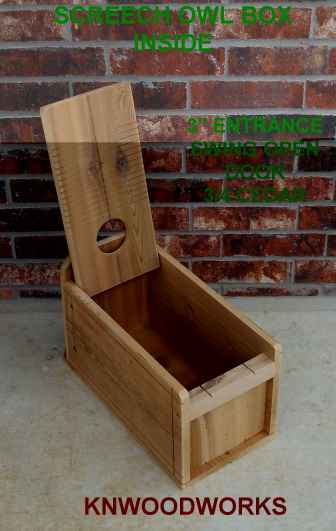 This is a hanging barn owl box it is made out of 3/8 plywood to keep it light for easier hanging. The item is painted 2 coats brown exsterior heavy duty paint for long life. The roof is removable for maintance and all hardware is exterior grade. Barn owls are raptors but unlike most raptors they are nocturnal. Know by many names such as White Owl, Silver Owl, Demon Owl, Ghost Owl, Death Owl, Night Owl, Rat Owl, Monkey-faced Owl, Church Owl, Cave Owl or Stone Owl. One of the few bird species that the female is more showier than the male. Barn owls have great hearing they can locate there prey in complete darkness just by sound. 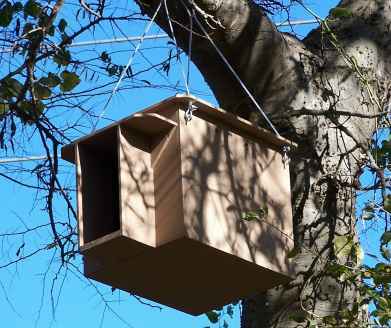 Barn owls adapt well to man made structures like attics,barns,storage sheds and nest boxes. Barn owls are great for rodent control, they can eat 2-3 rodents a night, a family caneat up to 10. Owls eyes look forward in a fixed position and cannot move from side to side, as the human eye can. In order to see peripherally, the owl must turn its entire head. Three screech owl species inhabit North America the eastern, western and whiskered (whiskered is the samllest of the three All three Screech-Owls are very similar in appearance ). Screech owls are clasified as north american small owls having ear tufts and a quavering whistlelike call (family Strigidae). The cry of the screech owl at midnight is said to portend evil. Eastern Screech-Owl pairs usually are monogamous and remain together for life. Screech owls can live up to 20 years but is uncommon in the wild to live even half of that. The Eastern Screech-Owl is known to eat a variety of songbirds, including the European Starling. Eastern Screech Owls have also been called the common screech Owl, Ghost Owl, Dusk Owl, Little-eared Owl, Spirit Owl, Little Dukelet, Texas Screech-Owl, whickering Owl, little gray Owl, mottled Owl, the red Owl, the mouse Owl, the cat Owl, the shivering Owl, and the little horned Owl. At one time, Western and the Eastern Screech Owl were considered to be one species, but they have since been split into two separate species.